While going through my trunk looking for UFO's I came across the Storm Water Scarf that I started after Christmas. 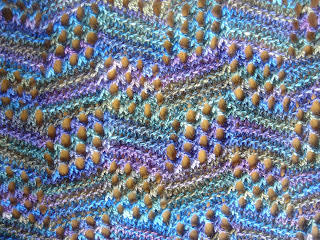 I had knit a little here and knit a little there but hadn't made much progress. Even though it was too recent a project to be officially considered a UFO I thought it would make a great spring scarf so I decided to finish it up, thinking it would only take me a day or two. I mean, it's a scarf, right? How long could it take? As it turned out, it took me a lo-o-o-ng time--hours and hours. 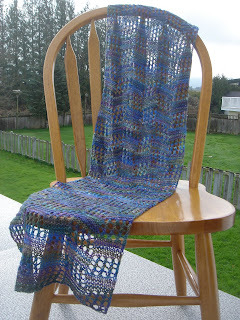 It was only one skein but it went on forever. I finally finished it last night just before dinner and blocked it before going to bed. Worth the wait, don't ya think?